As we see the massive deterioration of morals and principles in our public schools, the Left proudly continue to herald the incorrect narrative of “separation of church and state”. But is this really how our Founders intended it? As Indigo Montoya said in the Princess Bride, “You told me to go back to the beginning. I have.” By looking at the beginnings of some of the most prestigious colleges and universities, we can discover that religion was a vital part, if not the entire purpose, of their founding. As I explained in my letter Separation of Church and State, liberals have completely rewritten history regarding this phrase to fit their own agenda. Contrary to popular teachings and understanding by today’s youth, this phrase is NOT in the Constitution. It was in a letter written by President Thomas Jefferson in 1802 to Danbury Baptist Church, addressing their fears that the government may try to dictate their doctrine. Jefferson insisted that a “wall of separation between church and state” protected churches from state overreach. He never meant that the two should be mutually exclusive. Because of the Supreme Court ruling that began this ultimate lie, liberal progressives attack public schools demanding all references to God be abolished. By doing so, they do not progress into a higher state of learning, but fulfill exactly what the Founders were trying to prevent, the suppression of liberty and freedom. In 1691, Rev. James Blair was sent to England to ask King William III and Queen Mary II for a charter for a school. He requested "that the Church of Virginia may be furnished with a seminary of ministers of the gospel, and that the youth may be piously educated in good letters and manners, and that the Christian religion may be propagated among the Western Indians to the glory of Almighty God.” The charter was granted in 1693, and the school was named the College of William and Mary. Even before America was an independent country, liberalism began infecting her culture. 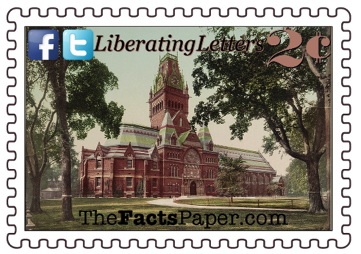 It permeated the leadership of Harvard. Wanting to move away from Harvard’s Calvinist Orthodoxy background, the governing body dismissed Rev. Increase Mather in 1701 as president. Mather had served Harvard well, including arguing the Biblical case against the Salem Witch Trials in 1692. (see Time Of Insanity). Mather was replaced by John Leverett, the first Harvard president who was not a minister, Bible scholar or deeply involved in the church ministry. He was a lawyer, judge, legislator, and otherwise associated with the government. Under his guidance, the school stopped producing scholars and started producing “gentlemen”. Seeing this movement towards liberalism, a group of Orthodox Harvard alumni founded Yale College in 1701. Their 1787 Student Guidelines included, ”All the scholars are required to live a religious and blameless life according to the rules of God's Word, diligently reading the Holy Scriptures, that fountain of Divine light and truth, and constantly attending all the duties of religion." Yale was able to hold fast to their roots of religion well into the 19th century before liberalism saturated their institution as well. The “Great Awakening” gave birth to several reputable colleges. The Philadelphia Presbyterian Synod was granted a charter in 1746 for the College of New Jersey. Jonathan Edwards and his son-in-law Aaron Burr Sr. were co-founders. They were among its earliest presidents, along with several other notable preachers of the Great Awakening. Another co-founder and its first president, Rev. Jonathan Dickinson, proclaimed, "cursed be all that learning that is contrary to the cross of Christ.” Students were required to not only attend worship services every morning and evening, but to conduct oneself with deep respect and seriousness. We now call this school Princeton University. King George II of England issued a charter for King’s College in 1754. There was an initial dispute regarding its location and religious affiliation. After the dust settled, the new Anglian school was built in New York City. Today it is known as Columbia University. Followers of George Whitefield began building The Charity School of Philadelphia in 1740 as a church and charity school. Building ceased after they ran out of money. Whitefield’s good friend, Benjamin Franklin, purchased the building in 1749 for his new academy. Originally a professed deist, Franklin became a member of the Presbyterian Church after being impacted by Whitefield’s message. Even though Franklin’s University of Pennsylvania was not associated with any particular denomination, Christianity was seen throughout its makeup. The school’s first provost (president), was Rev. William Smith of the Church of England. A Moral Conduct Student Law from 1801 read: “None of them (students) shall, without a good and sufficient reason, be absent from school, or late in his attendance; more particularly at the time of prayers, and of the reading of the Holy Scriptures." Not wanting to be left out, the Baptists jumped into the ring in 1764 with Brown University in Rhode Island. The Dutch Reform Church established Queens College in New Brunswick, New Jersey, in 1766 to “train young men for the ministry”. They are now alumni of Rutgers University. The first Catholic college in the United States was Georgetown University. Founded in 1789, it operated as both a college and Roman Catholic seminary. Liberty, this is just a very brief look at the beginnings of some of the oldest and most prestigious colleges and universities in the county. As you can see, they were overwhelmingly created using the Bible as a learning tool and Christianity as their guide. The Founders found no issue with this and even deemed it necessary for a civil society. Congress approved the purchase of Bibles to be used in the schools in 1781. In his 1796 farewell address, President George Washington advised citizens to learn Biblical teachings in order to carry on a righteous and fair nation. President Jefferson instructed that the Bible, along with the Watts Hymnal, be utilized in classrooms. Dr. Benjamin Rush, signer of the Declaration of Independence, not only wanted government required Bibles in the classroom, he wanted every family provided one at the public’s expense. He also wanted, "The Son of Man Came into the World, Not To Destroy Men's Lives, But To Save Them,” inscribing above the doors in courthouses and other public buildings. Many of the most influential American textbooks and readers, which included Washington’s farewell address, incorporated Bible verses and Biblical principles in their lessons. The decline of these higher institutions into Unitarianism, Hegelianism, and Liberal/Socialism/Communism/Progressivism is a story of its own. I will address that in later letters. What is noted here is these so called “higher learning” institutions are perpetrating the lie of their own beginnings. Most have even scrubbed their true Biblical foundations from their historical facts pages on their websites. Liberty, we built this county on the foundation of Christ. By removing this fact, everything can be crushed: life, liberty, freedom and responsibility. You must work diligently to find and spread the truth regarding the principles and values this country was founded. On God, Christ and the Bible. God is the “highest” learning you can have. Without Him, all else is meaningless.